The upload puzzle is solved if we can find a device which connects to USB, has power and ground, has a serial link (i.e. send and receive lines), and has two output pins which can be controlled from the USB side. We’re almost there with what has got to be one of the most common interfaces in embed-land by now: the “FTDI interface”. It meets all of the above requirements, except that it only has one output pin, tied to DTR on the USB side. There are tons of these on the market, some of questionable origin perhaps, but all extremely widely used and highly popular (as FTDI Ltd found out). The first two requirements are not essential, in that other combinations can be made to work with ARM chips, but it’s harder to get this right and you may get burned one day when you mix & match, and hook things up to another FTDI board with different settings. The “5V power with 3.3V logic” setting is the default for all the boards from JeeLabs, and probably also most of the other Arduino-compatible boards out there. Let’s get started. The worst that can happen is a “bricked” FTDI board – take your time! There is usually a pin on the FTDI header side of the board which is marked CTS (Clear To Send). This pins is not used with Arduino’s. It’s of very little use, being an input pin. The modification needed is to connect it to the RTS (Request To Send) pin of the FTDI chip, which is an output. There’s no need to disconnect the CTS input, since no one uses it. 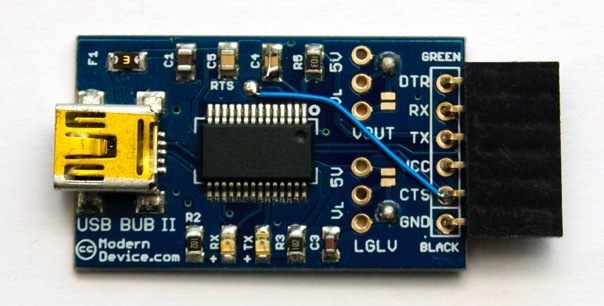 The bad news is that on many FTDI boards, the RTS pin on the chip is not connected to anything. That means you have to have steady hand, a fine-tipped soldering iron, and soldering wick to correct any problems – always a good idea for your toolset, by the way! The RTS signal is on pin 3 of this 28-TSSOP package – those pins are only 0.5 mm apart! The good news is that the “USB BUB II” available from Modern Device and resold in the JeeLabs shop has RTS exposed via an internal pad. This makes modification a lot easier. Make sure that the wire doesn’t touch anything but the RTS pad and the CTS header pin. This modification only applies to the BUB II, which inserts a capacitor between the chip’s DTR output signal and the FTDI header. This is harmless for JeeNodes, but will interfere with proper reset operation on ARM chips. Locate the tiny “C4” SMD capacitor on the board and either replace it with a short wire, or simply solder a wire on top to short out the capacitor, as shown in the image above. That’s it. This modified BUB will continue to work as before with JeeNodes, but it now has that extra RTS output pin available to also properly perform uploads on ARM chips. Otherwise, just hang in there and it’ll all be described in a lot more detail Real Soon Now.